Modernization and Destruction. Both the events of American Colonization and World War 2 have caused so much changes in Manila. It goes with the saying, "there is nothing constant except change". The following are a few landmarks that were MISPLACED in Manila due to the modernization and destruction of the early and the mid 20th century. The death of Tita Cory last 2009 was an event that marked my heart. For the first time, I saw a grieving nation. I was able to witness a president's death, wake and burial. After seeing the death march of Tita Cory from Manila Cathedral to Manila Memorial Park, I became curious. Question started to play on my mind, where do the other past presidents rest in peace? how grand are the graves of our past leaders? do I still know them? And so my quest of searching for these graves has started. My quest brought me from as far as Batac, Ilocos Norte in the north to Tanauan Batangas down south. It took me 2 years to finally reach all the tombs of our past presidents. From the grandest to simplest, all are indeed noble. I've been inside this Old Legislative Building a numerous times already, but never did I look beyond the mixes of pigments and shapes of the art works inside. Normally I would just stroll inside, look at a painting, read its label then move on to the next piece of art. I really don't know how to appreciate an artwork, how to interpret its symbolism and allegory. Good thing I have learned something from my Humanities class. And that something helped me to look beyond the strokes of paint brush, mixes of pigments and combinations of shapes. Thanks to my professor, Ms Peña, for waking the artist in me. Our final exam in Humanities involves art appreciation inside the National Art Gallery of the National Museum. And so we went there last Tuesday (10/04/2011). 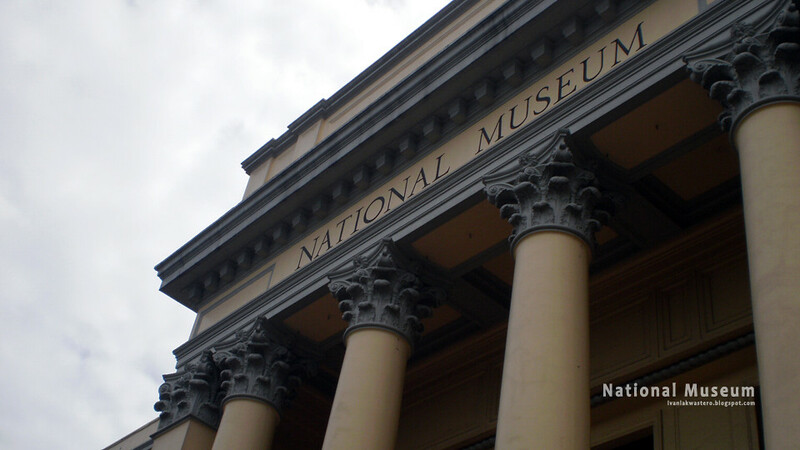 | The National Museum has two major galleries: 1) the National Art Gallery which occupies the Old Legislative Building, and the 2) Museum of the Filipino People which occupies the Old Finance Building. The National Art Gallery has the collection of the works of the National Artists as well as the works of the Masters Luna and Hidalgo. The other gallery, the Museum of the Filipino People, contains priceless artifacts and archaeological findings including the famous Manunggul Jar.